Today’s consumers connect with brands across multiple channels, which complicates the process of recognizing, servicing, and rewarding loyal customers. 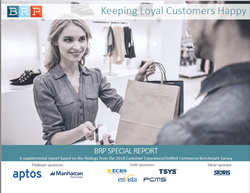 According to BRP’s SPECIAL REPORT: Keeping Loyal Customers Happy, customers expect engaging and relevant interactions and conversations across all channels and they don’t have any tolerance for unsatisfactory shopping experiences. Customers want a personalized experience and if they are treated well, they will reward the retailer through additional purchases and brand loyalty.